Maker/Marke: New & Lingwood, Poulsen,Skone & Co. 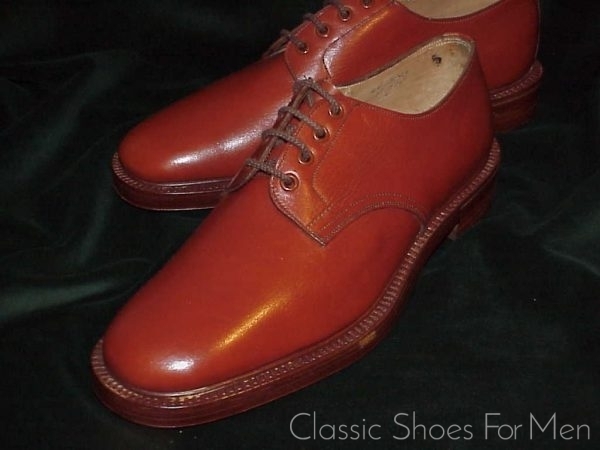 The 19th Century bespoke shoemaker Poulson, Skone & Co., defunct after 110 years in operation, is the subject of endless discussion by shoe aficionados. 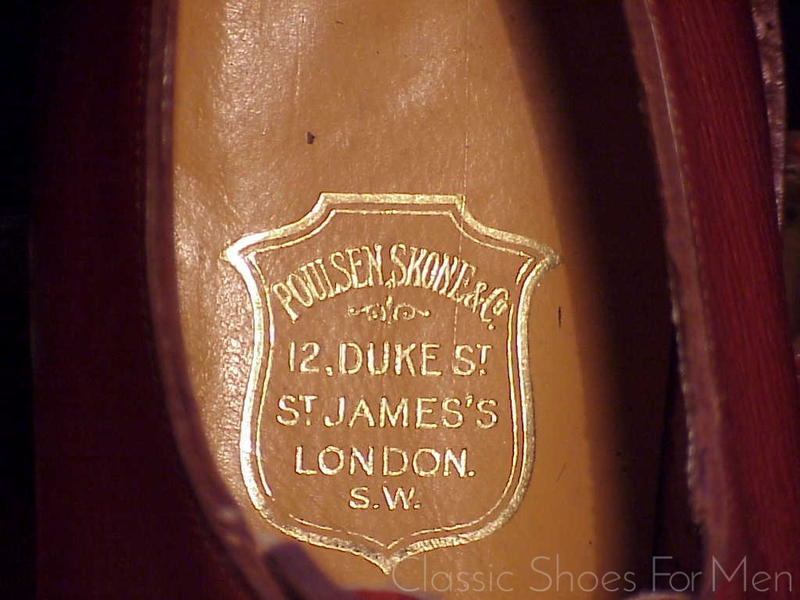 Sidney Skone, the son of the founder died in 1964 and New & Lingwood, itself a venerable firm begun in 1865, absorbed Poulsen, Skone & Co. in 1972. 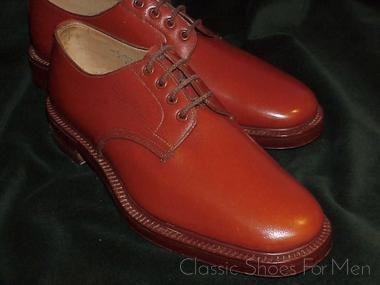 During the 1970s and 1980s, while the great George Cleverley was with the firm, New & Lingwood continued to purvey bespoke shoes of superior quality. 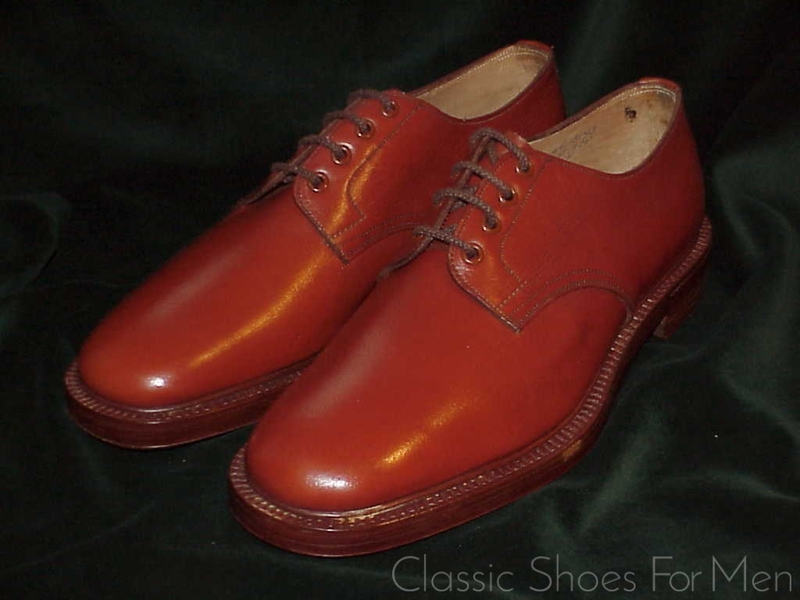 After Cleverley’s departure with his colleagues Carnera and Glasgow to reopen his own business, New & Lingwood continued to supply ready-made shoes made by Edward Green from Cleverley designs. 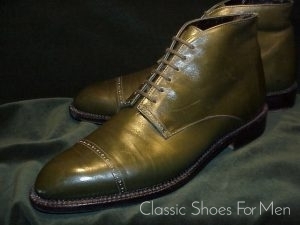 Cleverly styles from that period have entered the canon and are produced by more than one shoemaker today. 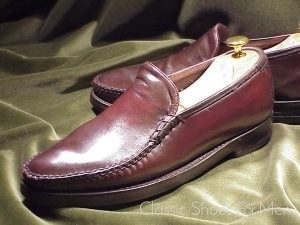 A good example is Cleverley’s beautiful design of the now ubiquitous “Butterfly” loafer. 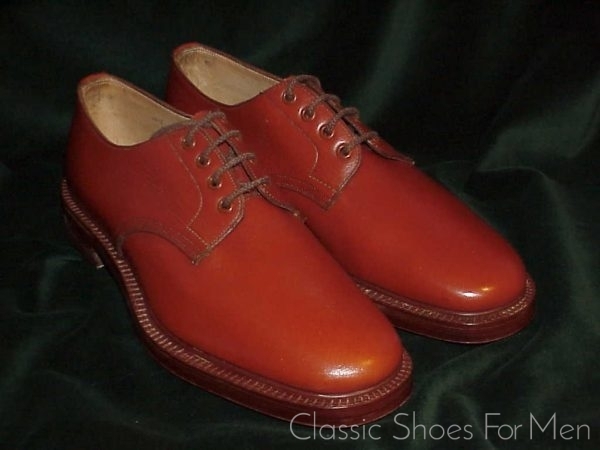 And in this century the name Poulson, Skone had reemerged at Dunhill’s, as a special order ready-made line produced, it is reported, by Crockett, Grenson and others. Shoes by Poulson, Skone under Cleverley’s reign in the 1970-80s are highly collectable and even the modern successors are most desirable. 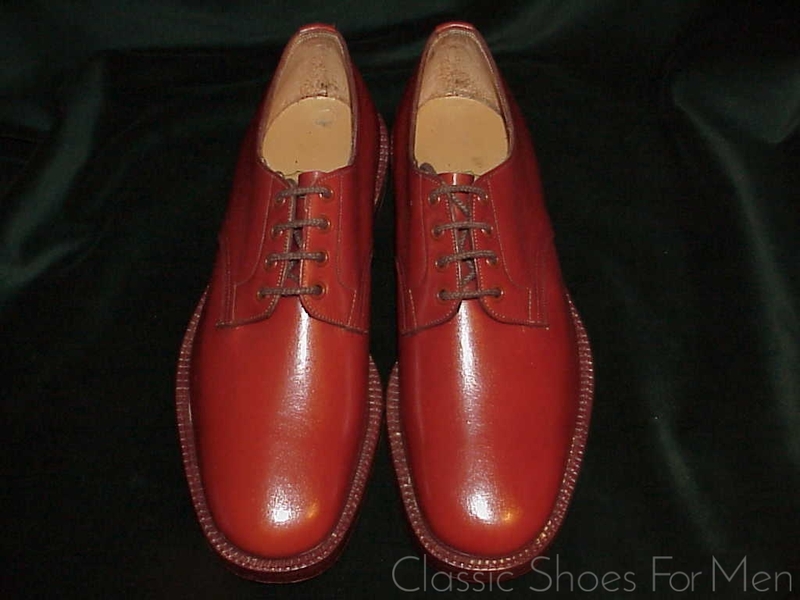 These names, Cleverley, Tuczek (to whom Cleverley apprenticed) Sidney Skone and his father before him, along with the many English masters bespoke shoemakers of the 19th century and the early and mid 20th century, Lobb, Tom Hill, Miller and others, are the stuff of legend. The present pair of shoes, dating from 1950’s and from the original Poulson, Skone & Co. at 12 Duke Street, London SW, is today, after more than half a century, a rarity even among rarities. This shoe is made by the hands of the master himself in the heyday of the firm. 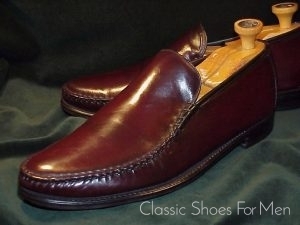 More remarkable yet is that this pair is in new and unworn condition. The design itself could not be more simple, a Plain Front, 4-Eyelet Derby but the workmanship could not be more refined, a double sole hand sewn to a double welt, the second welt being the split reverse or, so called, “storm welt” visible in the close-up photo of the side of the sole. The heel is finished in the old English tradition with a double row of hand-set (square headed) nails. 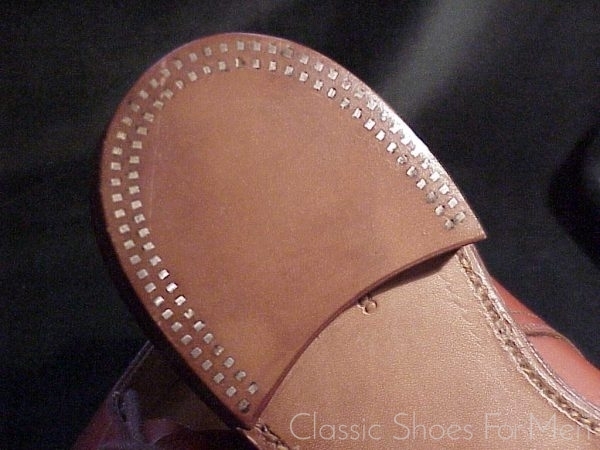 The eyelets are lined with steel grommets visible from outside. 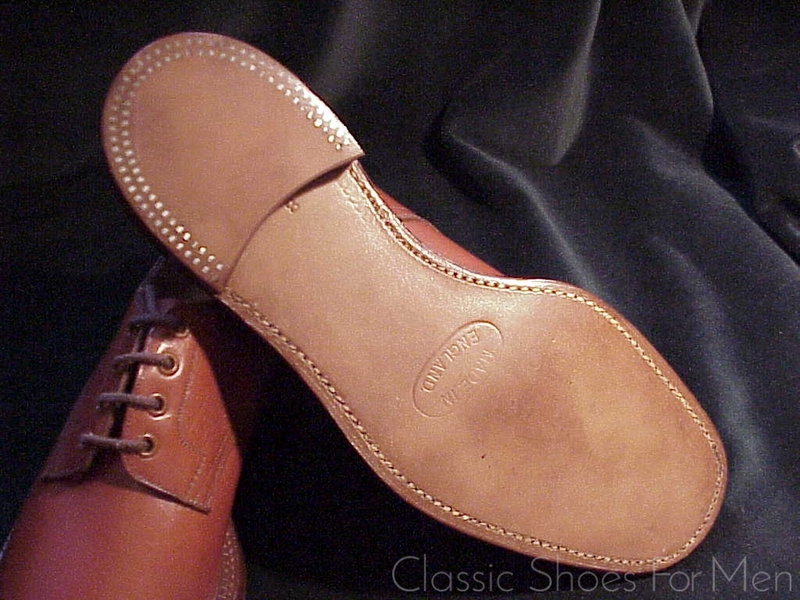 The original laces are themselves extraordinary, the best available round braded lacing. 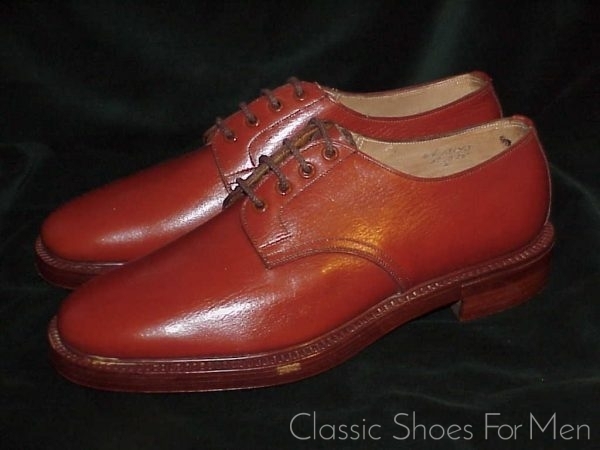 This is a shoe for you to wear for 40 years, and which will look more beautiful with the years. 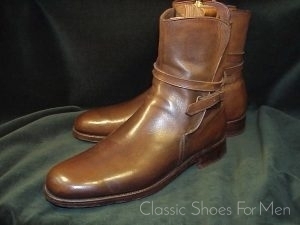 The heavy boot-quality full grain leather of the tops will endure forever and the bottoms are more sturdy than any shoe and most boots…and yet, because of the simplicity of the form, the effect is one of sleekness and elegance that never betrays the massive build quality of this masterwork. Finding such a treasure in new condition after 60 years is extraordinary and far more rare a find than any John Lobb or Edward Green of the period, both shoemakers having had a significantly greater output that Poulsen, Skone. 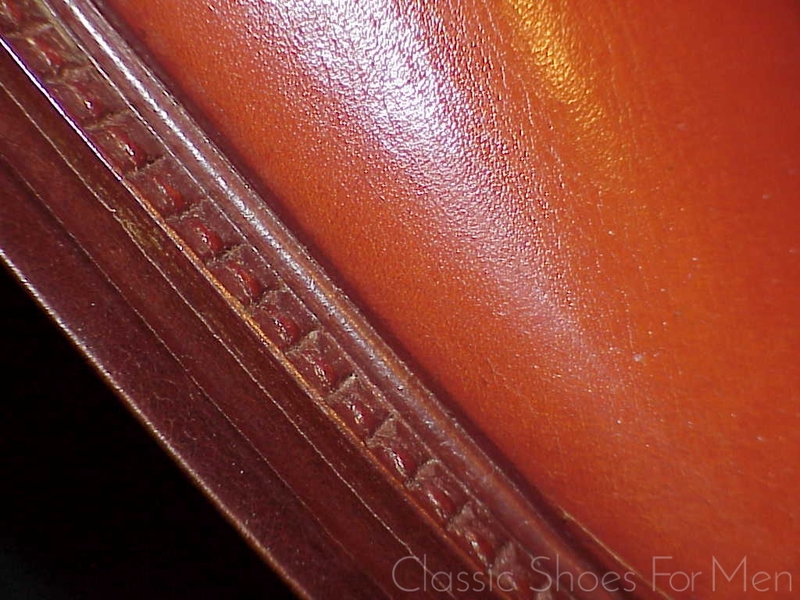 The shoe itself is lovely and extremely sturdily made, with double sole, hand-set horse-shoe nail pattern at the heel and fully gusseted tongue to repel water. This is a gentleman’s shoe from the old school, a fine and to be prized addition to any wardrobe and worthy of the advanced collector. (UK) 8E…..(US) 9D…..Continental 42 D for the medium-width foot. 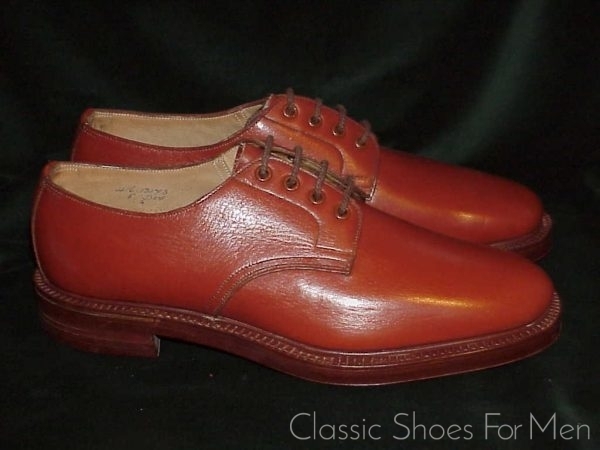 Der ehrwürdige 112-Jahre alte Schuhmacher Poulsen, Skone & Co. wurde in 1972 von New & Lingwood übernommen, der jedoch bis heute als eigenständige Firma mit eigener Designer-und Marketing Abteilung arbeitet. Von den späten 70ern bis zu seinem Tod 1991 arbeitete der berühmte George Cleverley als Design-Consultant für diese Firma. Vor ein paar Jahren entschloss sich die Firma einige der sehr individuellen Cleverly-Designs wieder aufzulegen unter dem Label von Poulson & Skone, jedoch von Edward Green hergestellt. Der jetzige Schuh aber stammt noch aus der Zeit vor der Uebernahme durch New & Lingwood, aus der Hand Sidney Skone’s, dem Meister persoenlich. Eine extreme Raritaet, absolut neu und ungetragen ….ein herrlich tragbares Meisterstueck fuer den raffinierten Sammler. Versandkosten: Käufer zahlt EUR 6,90 Versandkosten als versichertes Paket (innerhalb Deutschlands). Kaufabwicklung: Per Überweisung innerhalb Deutschlands.